Karl August Folkers was born in Decatur, Illinois on September 1, 1906. His father August William Folkers was born in Germany and had emigrated to the United States with his parents and married Laura Susan Black in 1904. As Folkers grew up he became interested in chemistry and obtained chemistry sets to experiment with. He attended the local public schools and he attended the University of Illinois at Urbana-Champagne where he earned a BA in chemistry studying under Carl Marvel in 1928. Folkers earned a PhD under Homer Atkins at the University of Wisconsin with a dissertation on using catalysts to reduce esters into alcohols. Folkers did post-doctorate work under Treat Johnson at Yale University studying biochemistry. In 1934 Folkers joined the pharmaceutical company Merck. In 1939 Folkers became the assistant director of research at Merck. Folkers is best remembered for his determination of the structure of vitamin B-12, which is also called cobalamin. Vitamin B-12 is unique among the water soluble B vitamins in that it contains an atom of cobalt. Vitamin B-12 is used in DNA synthesis and regulation and also fatty acid synthesis. It is synthesized by bacteria and archea and must be ingested by higher organisms. In humans lack of vitamin B-12 causes pernicious anemia where red blood cells do not develop properly and lyse easily. With Fern Rathe and Edward Kaczka, Folkers isolated the antibiotic cathomycin in 1955. Honors won by Folkers include the Perkin Medal in 1960 and the Priestly Medal in 1985. 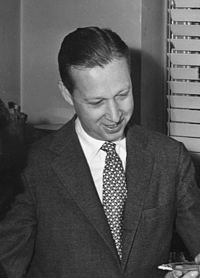 Folkers was elected to the National Academy of Science in 1948. Folkers died on December 7, 1997.